Brrrr….It’s Cold Outside…Is your Home Protected from the Weather ? Brrrr…it down right cold outside, however winter is an amazing season full of holidays, fun and snow. But water and ice, especially in the winter, can be very dangerous. Along with causing slippery roads and big snow drifts, water can do serious damage to your house. Here are some tips from DisasterSafety.org to protect your home from water damage this winter. First be sure to put insulation around your pipes. This will keep the water at a high enough temperature to prevent ice blocks in the pipe. Be sure to allow as much warm air to surround the pipes as possible. This can include leaving closet or cabinet doors open during cold snaps. If there are pipes in your home that simply cannot be kept as warm as the others, keep a small stream of water running through them as often as possible. If your pipes will not be used for a long period of time (during a vacation or the like), have your pipes drained. 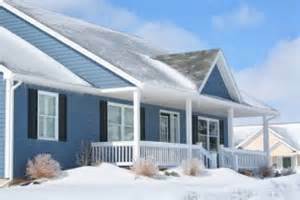 Ice dams are another winter issue for your home’s roof. This is when snow or ice on the roof melts and refreezes when it trickles down to the gutter. This can stop water from draining off the roof and result in roof leaks. One way to avoid leaks is installing a water repellant sheet underneath your roof covering. A way to prevent the melting and refreezing is keeping your attic cold. This can be done by insulating the attic floor so that as little heat as possible travels up and to the roof. Take steps to make sure your winter is safe and warm!